Lyon Antimicrobial Lockers are finished in an advanced powder coating technology from DuPont and Agion® Antimicrobial that inhibits bacterial, mold and odor build-up on locker surfaces, as well as the touch transfer of microbes on locker handles and doors. Here's how it works: Any moisture triggers the controlled release of powerful silver ions to provide superior antimicrobial protection for decades. These silver ions are noxious even to the drug-resistant MRSA superbug. The antimicrobial compound is completely inorganic, less toxic than table salt, less irritating than talcum powder and approved for medical devices and food contact applications. The cost for the protection is nominal, considering that it will last for the estimated 20-year lifecycle of the locker. A-1 Textiles offers a wide range of towels from economy to executive club towels. 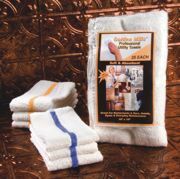 The full range of Golden Mills towels are available through A-1. These towels are manufactured to withstand institutional laundering and address the main concerns of clubs: quality at the right price and the non-absorbent towel. With its five shipping points nationwide, A-1 is able to offer quick and dependable delivery on all of its products. New to the market, Golden Mills Utility Wipes are available in white, white with blue stripe and white with gold stripe. Made of 100 percent ringspun cotton, these wipes are great for wiping down machines or just general cleanup. Finlandia has specialized in authentic Finnish saunas since 1964. They manufacture precut sauna packages in any standard or custom size to fit the customer's space or design. An exclusive product with Finlandia is the modular sauna, with a unique locking system that ensures the easiest assembly, strongest installation and most customized look. Finlandia has a choice of all clear select western woods. Other products include superior electric sauna heaters, exclusive etched glass doors and many authentic accessories. Penco Invincible II lockers offer a high degree of ventilation combined with heavy-duty steel construction, ideal for recreation facilities. Doors and sides have attractive diamond-shaped perforations to permit the free flow of air. Door handles are recessed stainless steel and are available with either multi-point latching or Defiant II single point latching. All models come in 21 standard powder-coated colors. Popular accessories include locks, slope tops and locker room benches. Penco also now makes plastic lockers made from solid high density polyethylene (HDPE)—ideal for wet areas. Bradley Corp. is bending the rules of design with its patented FrequencyTM Lavatory System. The Frequency combines a lower ADA-compliant sink with a higher sink, making it ideal for washrooms in upscale retail centers, restaurants, offices, hotel lobbies and fitness centers. Six models provide design flexibility—a series of Frequency stations can be combined to create a wall of waves. The Frequency Lav is made of Bradley's Terreon® solid surface material in a choice of custom colors. DuraGrid® safety matting is the ideal, cost-effective solution for unsightly, cracked areas and provides a cosmetically appealing cushioned surface. The free-draining, slip-resistant matting contains Vinyzene® SB-1, an antimicrobial agent that fights mold, mildew and infectious bacteria. Patented 12-inch by 12-inch by 1/2-inch interlocking tiles simply snap together to form a surface of any size, length, width or shape. Modules come in three styles and five colors: beige, gray, brick red, royal blue and black. Perfect for any locker room shower area. 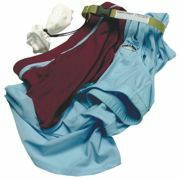 Laundry Loops® offer a time- and money-saving alternative to mesh bags or brass pins—for managing daily laundry of teams and groups. Garments stay sorted while they wash and dry. Clothes get cleaner and dry in half the time required for mesh bags. Eliminates snagged garments and dented dryer drums caused by brass pins. Laundry Loop® with Sock Snare (Pat. 6,038,748) is the original laundry strap—and it's still the most effective way to manage group laundry. Voted "America's Best" group laundry time-saver. Ready Care offers thousands of locker room amenities, from basic shower gel to all the extras. Bulk liquids for close to two cents per user will meet your budget and quality requirements. Ready Care dispensers are durable and easy to clean and refill. 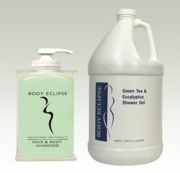 Custom screen-print your logo or choose stock Body Eclipse® dispensers (pictured). Screen-printed artwork will last—unlike labels, which become soggy and peel off while also creating excess waste. Ask about free dispensers. Find personal care products, wet bags, AthletixTM fitness equipment cleaning wipes, retail items and more, all in stock, from one convenient source.